Protesters have gathered on Kiev’s landmark Maidan Nezalezhnosti square and set up tents, demanding President Petro Poroshenko and his cabinet to report on the implemented reforms promised by his government a year ago. About 100 protesters set up at least five tents at the site of last year’s uprising against former President Viktor Yanukovich on Sunday, according to TASS news agency. The protesters are demanding that Poroshenko and his cabinet “talk to the people,” and report to them on what progress has been made in implementing the reforms which were promised last year, one of the organizers, Rustam Tashbaev, told Ruptly video news agency. He stressed that the activists are not calling for the overthrow of government. 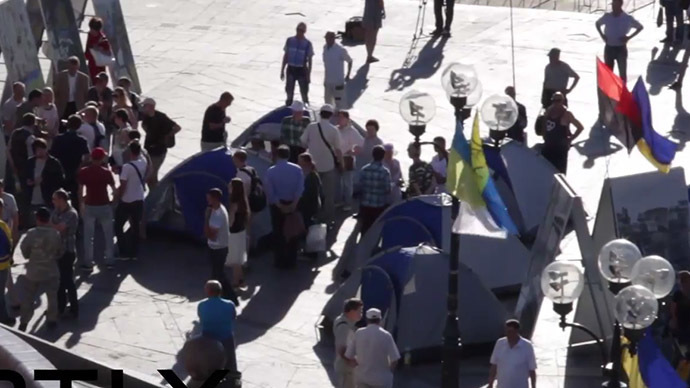 Tent camps and sit-ins played a major role in the Maidan protests that resulted in a government coup in Ukraine in February 2014. The Maidan protests started in 2013 as a peaceful campaign against then-President Viktor Yanukovich’s refusal to sign an EU association deal. Following the coup, the new authorities promised to undertake the political and social reforms needed to meet EU economic and democratic norms, so that Ukraine could eventually join the union. However, the government seems to have failed in carrying out constructive reforms, as the country has plunged into an economic crisis and is heavily dependent on international lenders. Poroshenko has acknowledged that he’s not satisfied with the achievements of his year-long presidency. “Whether I’m satisfied with the work of the government? I’m not. Neither with my work nor the work of Parliament. But most importantly – the people are not happy with all of us,” he said speaking to lawmakers during his annual address to Parliament in Kiev on Thursday, according to The Kiev Post. Meanwhile, a massive anti-government march took place on Saturday in the streets of Kiev. Some 3,000 people gathered for the rally, with protesters calling for the current government’s resignation and economic reforms.